21 JulWhat do we need cross-media analysis for? At InSideOut10 our mission is to create user-engaging experiences to help people interact with digital contents. We rapidly prototype concepts, design solutions and build tools to help businesses, institutions and individuals organise, distribute and promote online contents. Our goal in MICO is to validate assumptions, models and technologies with field integrations and real-world use cases covering different aspects of media extraction and cross-media analysis. We plan to do so by engaging with actual end-users working in a diversified range of contexts and using our existing set of tools and solutions. Video streaming has always been a key asset for our team and we have made strong headway in recent years in partnership with RealNetworks with major rollouts for many Tier-1 operators and broadcasters in Europe, Middle East and Africa. In 2011 we created Helix Cloud in partnership with RealNetworks, a middleware platform to help content providers and telcos, creating end-to-end multi-screen video streaming solutions. 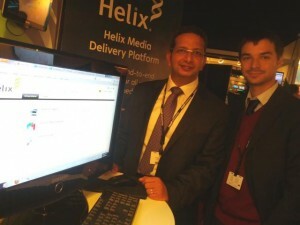 Helix Cloud integrates with the Helix Universal Server (the video server developed by RealNetworks) and exposes Web APIs to fully automate user management, content ingestion, content publication, playlists management, conditional access and reporting (here is a presentation describing business scenarios such as Hybrid TV and Over-The-Top TV where Helix Cloud has its own roots). Helix Cloud is being used by operators like A1 Telekom Austria for running their own business-to-business online video services and helps broadcasters and content owners in Austria distribute their contents over A1 Networks and on the Internet. When a video is uploaded to Helix Cloud we make sure it gets delivered flawlessly on every device and anywhere in the World. We help secure these contents and we prevent content theft and link hijacking making sure only authorised users have access. The player technology behind Helix Cloud can be fully customised in every small details to match whatever look and feel a client has in mind and provides player controls and social media sharing buttons as you would expect. Nevertheless when embedded, the video object remains agnostic to the page context, it hardly integrates with other media and doesn’t provide the user other than the usual “press play” experience. While we provide smooth advertising integration (as defined by the Internet Advertising Bureau with its Digital Video Ad Serving Templates – VAST) with support for pre-roll, post-roll and mid-roll using server-side playlists that seamlessly work on both web and mobile – end-users have no other means to access these clips other than the play button that initiate each video from the beginning. More over today a video clip being produced by an organisation cannot be easily re-used on other channels as its segments are not actionable (meaning end-users don’t have direct access to specific sub-parts of the videos using standards like W3C Media Fragments as described by Thomas in his post on SPARQL-MM). As part of our toolbox we also have developed WordLift adding Dynamic Semantic Publishing to WordPress (here is an overview of WordLift upcoming release). The goal of WordLift is to create and publish custom vocabularies (collections of named entities), interlink them with publicly available linked data resources and make contents more fun to be consumed by humans as well as machines (using standardised formats such as schema.org for marking up named entities). WordLift provides easy-to-use ways to create and manage custom vocabularies, organise blog posts and exposing site contents and metadata as Linked Open Data using Tim Berners-Lee Linked Data publishing principles. Till now, regardless of the advantages of using – in web publishing – this underlying network of linked annotations we cannot manage anything else than textual contents and the links between these annotated texts and media such as videos and images are still missing. With our Egyptian team we’re currently developing an instant video recording mobile application called Shoof and a website to let anyone tell stories that make you proud of living in Cairo and describe how life can be in the largest city in the Middle-East and Africa. After the turmoil following the Arab Spring revolution new generations using social media are eager to create and disseminate knowledge to address local issues and generate new economic opportunities and social value. Shoof wants to catalyse these energies by providing means of creating fresh new contents that can be used by established media (either online or traditional). We’re excited to develop new media applications using MICO, Linked Media and Semantic Web technologies like SPARQL-MM by integrating them in our developer toolbox, existing solutions like WordLift and Helix Cloud as well as new projects like Shoof. The business value of course varies accordingly to each application context. Overall we believe Linked Data approach should lead to better applications, better services for our clients, and, in some cases like Shoof: better story-telling (meaning higher engagement rate with our users).